Vui's Kitchen — Vui's Gets a Shout Out in nFocus! This month, nFocus Magazine features Vui's in their Local Flavor: Pho Real section. We're seriously pumped that people are loving Vui's in Germantown. Make sure to stop by, fill up on some Pho and enjoy some Vietnamese Ice Coffee on our massive patio. 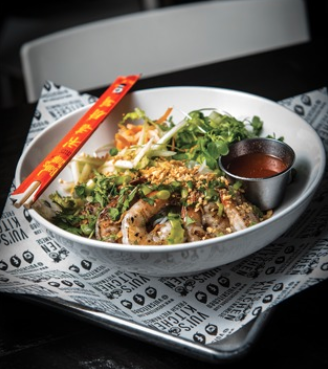 "Once again, restaurateur couple Vui and John Hunt have wrangled the far-flung and fresh flavors of Vietnamese cuisine — from fish sauce and hoisin to Sriracha and lemongrass — into an eatery that feels simultaneously global and local. On the heels of their Berry Hill blockbuster debut, the Hunts have planted a flag in the burgeoning dining district of Germantown, turning the patio-heavy location of the former Cochon Butcher into an Asian-inspired eatery that has fast become a landmark for healthy dining."